Therapy at the speed of light? Dr. Joseph Mercola has built the most visited natural health website in the world, reaching 25 million readers each month. He is a Christian who sees tapping as a gift from God and teaches “EFT is done through you, not by you.” On his training DVDs, Dr. Mercola describes the immediate and powerful results he witnesses from tapping as “therapy at the speed of light.” Following are a small sampling of the ground-breaking studies illustrating the extraordinary benefits of tapping. “A randomized, controlled trial of veterans who received EFT found that their pain dropped by 41%, even though they were being treated for PTSD, not for pain. The reductions in pain were simply a fortunate side effect of their PTSD treatment. EFT work has also proven effective with genocide survivors in Rwanda. Now adults, these orphans experienced incredible healing. A documentary reports “trauma outbreaks were reduced by an astonishing 90% in just one year.” You can watch a moving eight-minute story on this incredible ministry here. The mountain of research continues to grow with near-miraculous accounts of life-changing breakthrough. EFT has been consistently demonstrated to be an effective approach with trauma victims and soldiers returning from war. Counselors have used tapping with school-shooting survivors in the U.S. and displaced refugees overseas. There is almost always one thing in common: they not only achieve outstanding results, but also the stressful consequences are neutralized and positive benefits realized more quickly than anyone expects. In our book we share many more dramatic testimonies along with stories of how tapping can help with our everyday events as well. Tapping empowers us to effectively let go of frustration and disappointment, reduce stress emotionally and physically, and overcome panic and overwhelm. EFT can be used to address the big issues, the small issues, and everything in between. Of course, we know this world has its trials and trouble, but Jesus said to be encouraged because He has overcome the world (John 16:33). While it is true we were never promised a life without rain, we can certainly choose to live like Jesus and have peace in the midst of the storms (Mark 4:39). Tapping can unlock the peace within us. It opens us to experience the Kingdom of Heaven that is within (Luke 17:21). It unblocks the energy and life of the Spirit to flow freely through us—spirit, soul and body. 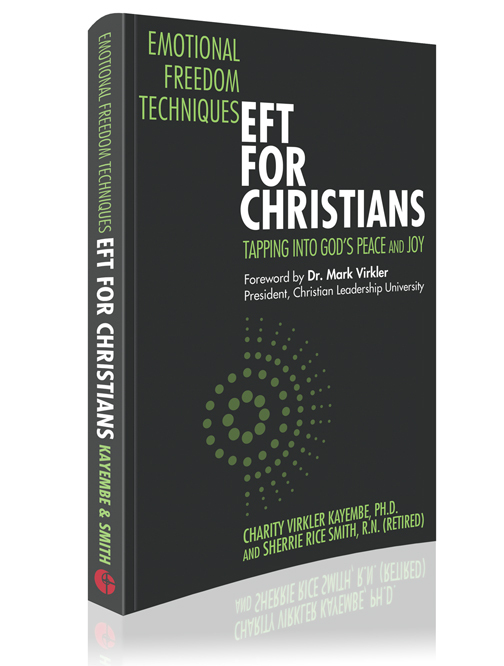 To discover more about tapping from a biblical perspective, check out our book, EFT for Christians – Tapping into God’s Peace and Joy. If you prefer to listen and watch, Dr. Jim Richards and I recorded 24 sessions of teaching on EFT at his annual Heart Physics conference and you can check out those resources here.